Passover is, fundamentally, a commemoration and retelling of the story of the Exodus. It is the tale of the ancient Jews’ escape from slavery at the hands of Pharaonic Egypt, the miracle of the crossing of the Red Sea and ultimate deliverance to the Land of Milk and Honey. All of this is reflected in my “Gefilte Fish” of Grouper with Fava Bean Purée and Pickled Green Onions. Prepare the Pickled Green Onions. Combine the first five ingredients in the bowl of a food processor and process to a loose slush. Trim the root ends off the green onions and trim and reserve for another purpose (such as adding to sour cream for baked potatoes) the green tops. Slice the green onions lengthwise and pack, with the rest of the ingredients in a mason jar. Refrigerate for 2 or 3 days before serving. The pickled onions will keep in refrigerator for up to 3 weeks. It is perfectly acceptable to use good quality pickled shallots which can, for example, be purchased at nearly any Asian market. However, it is also not difficult, with a little planning to make excellent pickled green onions yourself. Prepare the Tomato-Safflower Oil. Combine all of the ingredients in a sauce pan and simmer for half an hour. Remove the oil from the heat and allow to cool. When the oil is fully cooled, and has fully settled, spoon off the orange oil at the top and pour through a funnel into a squeeze bottle. Prepare the Grouper “Gefilte Fish.” Sweat the onion, carrots and celery in a covered saute pan until they soften. Working in batches, purée the mirepoix with the grouper and the egg white in the bowl of a food processor until fully combined into a relatively smooth paste. Oil the insides of four ring molds (an emptied can of tomatoes or tomato paste – for example – could work if both ends are cut off) and fill with about an inch of the grouper purée. Use the bottom of a wine glass or other object which will approximate the size of your ring molds to press the purée downward into a relatively solid mass. Heat a large sauté pan with just enough oil to very lightly coat. Transfer the ring molds with the grouper purée to the pan and cook over medium heat for 2 to 3 minutes. Using tongs, turn the ring molds over and press the purée downward to the bottom of the inverted ring molds (so they are in contact with the pan) using the white wine glass. Cook for another 2 to 3 minutes until the “Gefilte Fish” is cooked through. Prepare the Fava Bean Purée. If using fresh fava beans, remove the beans – still in their internal covers — from their pods. Blanch the beans and immediately shock them in ice water. When cool, remove the beans from their internal covers by slitting the cover using a paring knife and then squeezing the tender green inner bean out. This is an important step that must not be skipped. It is perfectly acceptable to use frozen beans (often labeled as “broad beans” and, if you are very lucky, “double peeled broad beans”) instead of fresh but, as is nearly always the case, the fresh ingredient is superior. Puree the beans with stock and the vinegar in the bowl of a food processor or, better yet, a vitamix or other high-speed blender. Assemble the Dish. Pour about two tablespoons of the Fava Bean Purée into a soup bowl or dish and spread in a circular pattern. 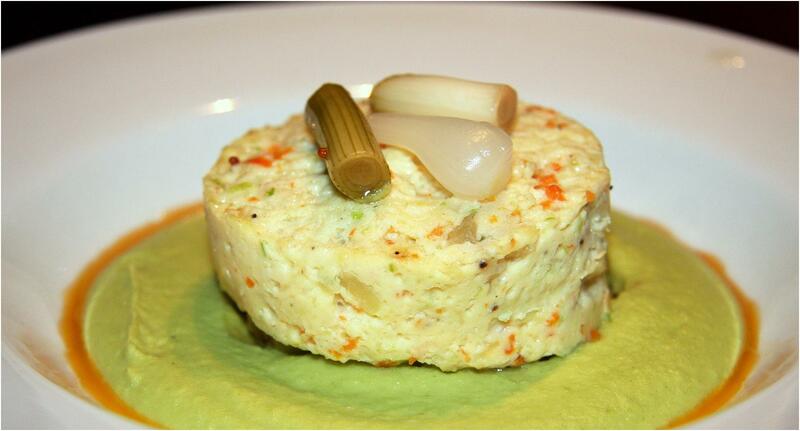 Center one of the “Gefilte Fish” on top of the Fava Bean Purée and top with two to three of the Pickled Green Onions. Line the outside of the Fava Bean Purée with the Tomato-Safflower Oil.